Corey Pronman has released his top-57 NHL prospects (subs req’d), and the Rangers have four prospects that made the list. 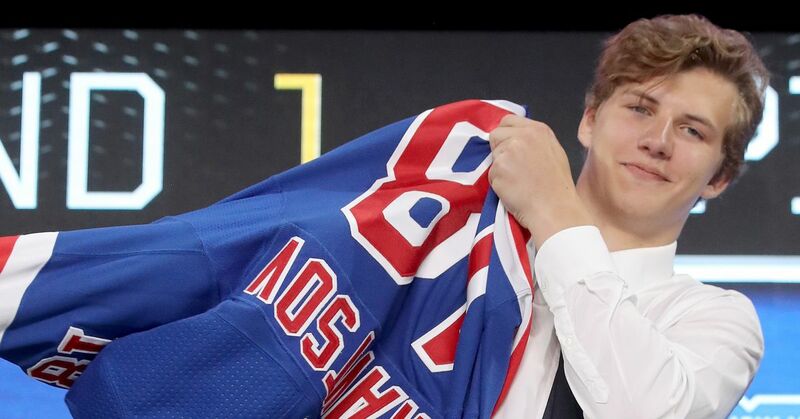 The highest ranked prospect was Vitali Kravtsov –who was ranked higher than Oliver Wahlstrom, for the record– and the Igor Shestyorkin came in as the top goaltender. K’Andre Miller was the other Ranger to make the list. Olof Lindbom made the top-20 goalie list, which I found to be interesting. Worth noting that Lias Andersson did not make the list. That will spark some debate, but if you do simple math (57 skates, 31 NHL teams), then unless a team has a ridiculous system, only 1-2 prospects per team makes the cut (assumes a few things, but my point here is that a third prospect from a team wasn’t likely). If Kravtsov and Miller are ranked ahead of Andersson’s peak ability, which they should be, then it makes sense he’s not on the list. That does not mean he is a bust. "Rangers with three prospects on Pronman's top-57 NHL prospects", 5 out of 5 based on 8 ratings. Lias was a #7 overall pick in 2017. I am thinking if he was as good as where he was taken, he should have made the list. Just because people boast his is not a bust, does not mean he will ever be a top 6 player. Someone taken at #7 overall should be top 6 material. You can believe he WON’T be a bust, but as of right now, he is leaning that way. Lindbom was selected as the Best Goaltender at the 2018 IIHF U18 World Championship, as he posted a 1.66 GAA and a .949 SV% in six appearances to help Sweden earn a bronze medal. Lindblom played his 1st game in a couple of months last week, promptly gave up 5 goals. Bad luck that he got hurt, but dumb luck to draft any goalie that high. Tourneys for goalies are overrated if it doesn’t jibe with what they’ve done all year. It appears that TSN did a better job of researching the kids. Kravtsov looked very good at the U20 tournament, playing center, rather than his natural wing. Kravtsov even had to play injured himself, due to one of the teams other center being hurt. The kid is good!!!!!!!!! Using Pavel Zacha of the Devils as an example,Lias needs to play in the NHL. Zacha is being given every opportunity to succeed. As the #6 pick in 2015, he’s yet to score more than 8 goals despite playing nearly a full slate the past 2 seasons. Maybe he won’t play up to his billing, but the Devils are giving him the chance. Lias needs his chance, he’s still a high-end prospect.